In Indonesia, a mobile application for women has been developed to detect the early stages of breast cancer. In Thailand, a mobile health screening service is made available to its increasingly aging population. In South Korea, a walkway beautification project has been built to ensure the safety of commuters, as well as sustainable living through energy-efficient measures. 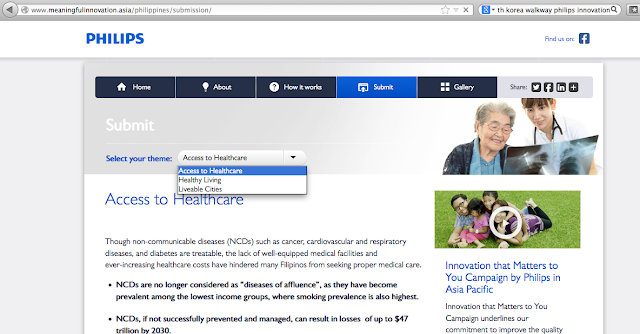 All these initiatives began as simple ideas by folks like you and me, brought to reality by Philips through its Innovation that matters to You campaign, which leverages on technology as an important tool in making life better for everyone. The great news is, this same campaign was recently launched here in the Philipines, where we get our chance to get Philips to spearhead a project that will benefit our fellow Pinoys. 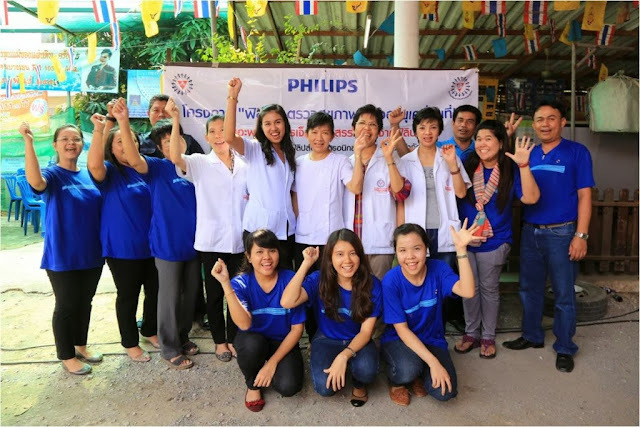 “Philips has always been focused in offering products and services that help improve people’s quality of life. This time, however, we want to go a notch higher, by involving the society in coming up with actionable innovations that can create lasting positive change,” said Fabia Tetteroo-Bueno, Country Manager of Philips in the Philippines. This is an initiative meant to be for the people, by the people, and with that, Philips is soliciting ideas from Filipinos who have brilliant solutions for three crucial areas that need immediate attention in our country today: the creation of livable cities, promoting proper nutrition among families, and providing easier access to quality healthcare solutions. “This campaign leverages on the Filipinos’ willingness to help, and their sheer motivation to do their part in making the country a better place to live in despite the odds,” said Tetteroo-Bueno. Got a brilliant idea? Submit your game-changing, genius solution to making your city better, your family's life healthier and your access to health care easier via the Innovations campaign website www.meaningfulinnovation.asia/philippines. But remember, your ideas should be realistic (no alien warships involved), impactful (not something that will just benefit you and your boyfriend), and should fall under one of the three idea categories given. A select panel of subject matter experts will be shortlisting six ideas that meets Philips’ objective of creative positive change. The individuals/organizations behind these six suggestions will then undergo a mentorship workshop with some of the Philippines’ respected visionaries, to further fine-tune their ideas, and make them more actionable. Philips will then select one winning idea, and implement the chosen innovation in 2014. They won't take credit for it. It will all be credited to you. Yes you. I promise, the glory will be all yours. Or mine, when my idea makes the final cut. Ahihi. Last Christmas, I bought a lot of our Christmas presents from Domesticity. 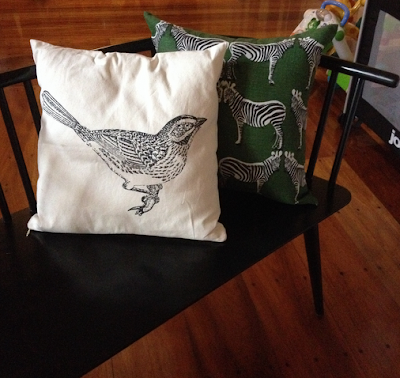 Throw pillows, tea towels, notepads and notebooks, that were not only pretty, but practical too. Of course, while shopping for gifts, I picked up a couple of pieces for our place, 2 sets of place mats, a napkin holder, and a cutlery tray that instantly perk up my table settings year round. The beautiful thing about Domesticity is that is more than just a company that makes lovingly handcrafted products for our homes. It is a social enterprise that was started by Mariel San Agustin in 2002, and has gone on to support all on-going programs and the beneficiaries of the Gawad Kalinga San Agustin Legacy Village in San Carlos City, Negros Occidental. Galing no? It just makes me want to shop Domesticity all the more! Did you spy the large storage boxes? Parang I need 10 of those. So perfect for household kalat! Here's a closer look too at the latest designs I spotted during the last Negros Trade Fair. ...plus a tray and a baguette basket, eeep! Seriously, it's kind of hard to walk away without getting something for myself every time. The great thing is, I can always say, "It's for a good cause!" Shop Domesticity online at mydomesticity.com and Like Domesticity on Facebook: https://www.facebook.com/MyDomesticityPH to stay in the loop on the Domesticity bazaar tour, so you can follow Mariel like a die-hard Domesticity groupie. Remember the Dychiao Signature of Love that I shared with you not too long ago? I still enjoy watching our Signature of Love video to this day, and I know that even if Berry can’t express her emotions eloquently yet, and Xavi can only grunt, shout, smile, babble and say 2 syllable words, we know that our silly and sweet little ways of expressing "I love you" is just as heartfelt as any grand gesture. Xavi and I actually have a new thing now, doing “beautiful eyes” at each other. Like, we’re looking at each other from across the room, and he’d look at me and close his eyes and I’d do the same thing, and then he’d copy me back, with a naughty glint in his eye. I love how we can communicate quietly, playfully understanding and picking up on each other, just like that. Berry, Xavi and Dada have their own thing too, where Dada throws Berry up in the air and catches her, resulting in peals of giggles. Then Xavi joins in on the fun, asking to take his turn. When Xavi gets his turn, Berry begs for another round! Dada feels like a rockstar being chased by die-hard fans, hahaha. Which reminds me! 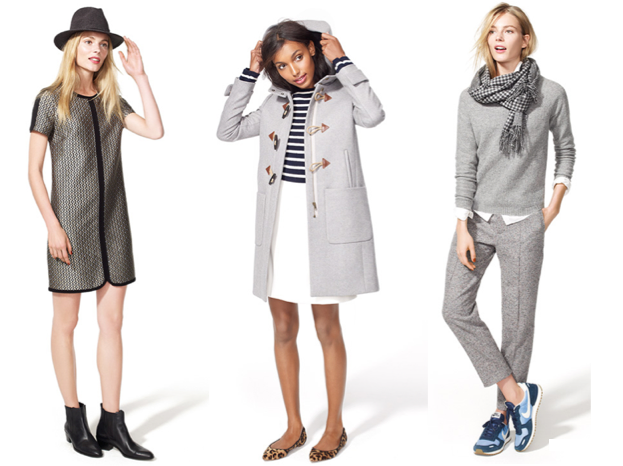 Have you seen the entries for the Johnson’s Signature of Love Campaign? Better yet, did you join? About 200 moms from all over the Philippines shared their Signature of Love videos, and Johnson’s Baby put together a compilation of the cutest, most heartwarming Signatures of Love from the entries. And guess what, we’re part of it pala. Eeeep. I was super kilig when my friend Jana told me she saw me, Berry and Xavi in the compilation video. Na-extra kami! I was all the more shocked when I saw the same video on TV. OMG. I should have put on make up and blow-dried my hair for our video. Hahaha. Watch us here, along with the other moms & their adorable babies who just know how to tug at a mom’s heartstrings. We will copy all of your Signature of Love too! Heeheehee. 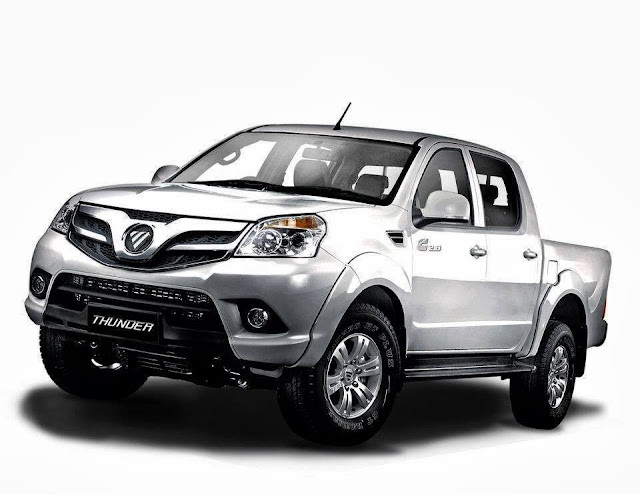 Same question I asked when I first heard of it, and as it turns out, it's a huge Chinese motor company known for manufacturing commercial vehicles - trucks, pick-ups, vans, SUVs, and heavy equipment. It was first founded in 1996 and in less than two decades has grown into an industry leader, partnering with the likes of Daimler AG which owns and produces Mercedes-Benz, Smart, Freightliner and Maybach cars and trucks. As with all China-made and Chinese homegrown products, a big come on is the affordable price, with the Foton Thunder pick-up truck selling for less than Php 900,000. Yes, true story. And worth learning more about! 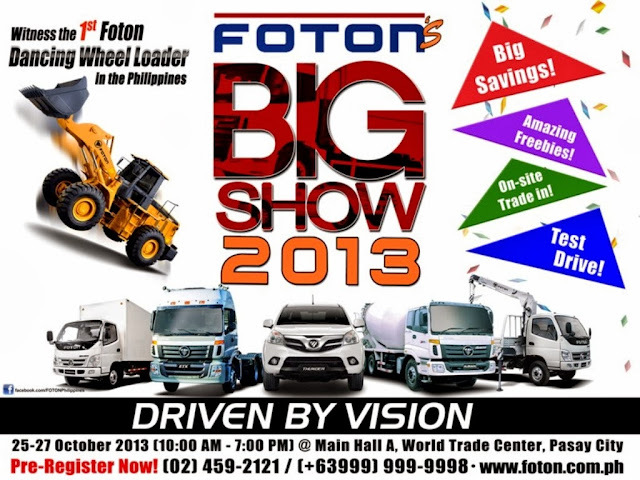 Discover Foton vehicles and trucks at the Foton’s Big Show 2013: Drive by Vision Grand Launch at the World Trade Center on October 25, 2013 and witness the launching of the new Foton View Traveller, a coaster/mini-bus perfect for shuttle operators, as featured by the auto section of PDI. 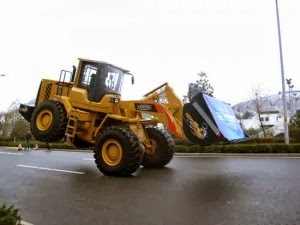 Worth seeing as well is the FOTON Dancing Wheel Loader, a first in the Philippines, and reminds me somehow of Transformers. 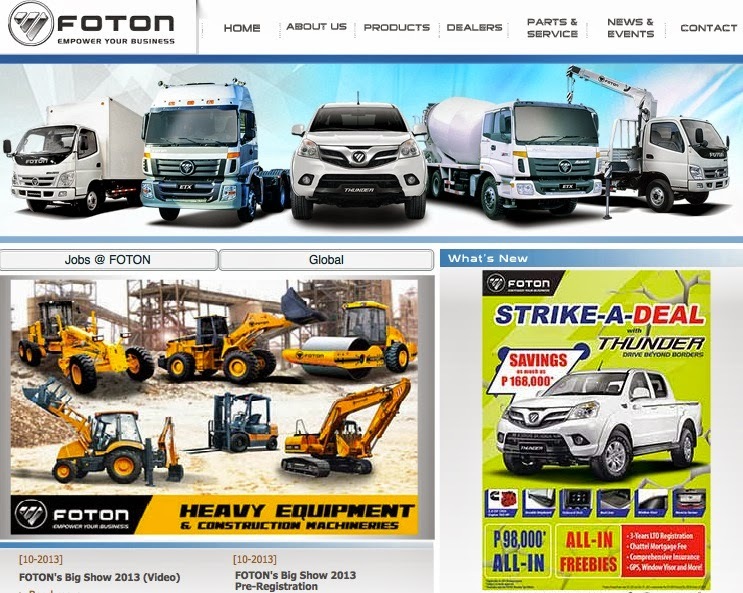 For those looking to buy a vehicle, the show is a chance to trade-in old vehicles from October 26 to 27, and avail of discounts and rewards when purchasing Foton vehicles at the event. 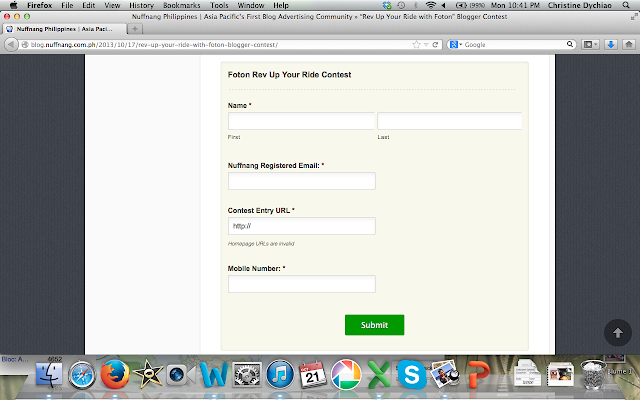 Watch out for giveaways too just for coming, test driving passenger vehicles or attending forums and trainings. Bring the family, there is no entrance fee. How to get in? Register your attendance to the event through the registration form at the bottom of this page! 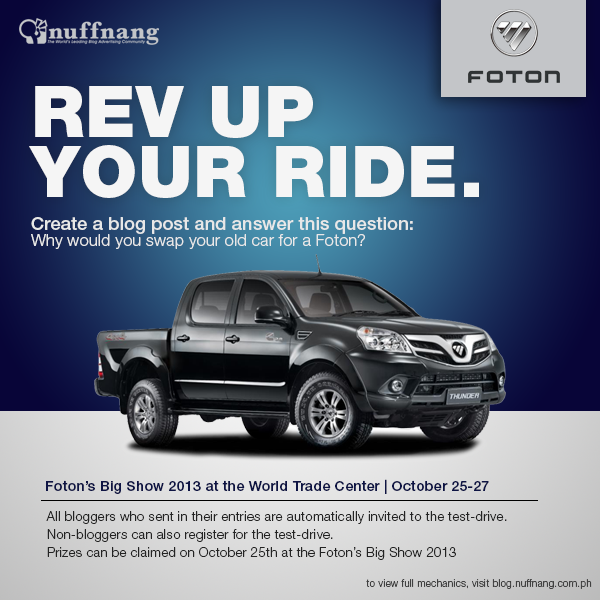 Bloggers, you may want to blog about this event too. Last day to have that post up is today! It's gonna be worth the effort as you may win an iPad mini or be one of ten winners of Php20,000 each! "Seychelles? Isn't that a country? A tax haven? 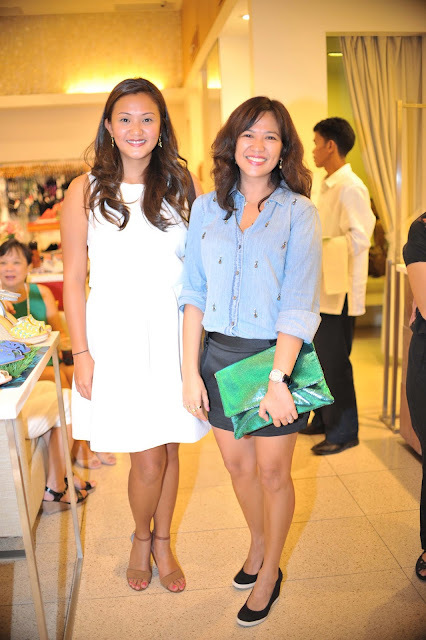 Dada asked when he saw me looking through the launch photos that Pia Miranda sent me. Well, he's right. But there's more to Seychelles than being a tax-evader's paradise. 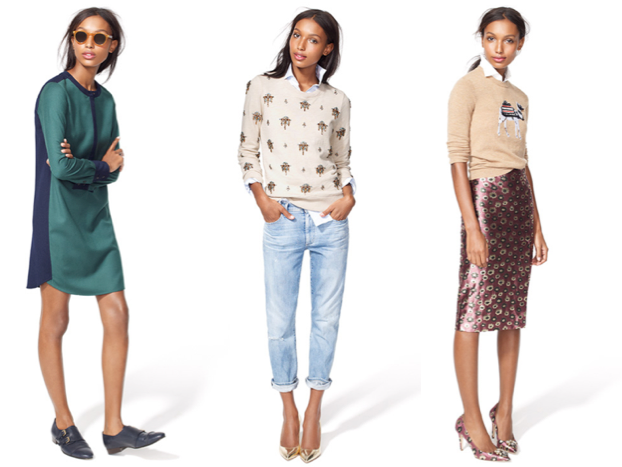 It's the kind us girls can relate to, because OMG, Seychelles is about cute shoes!!! It was Anj Dinglasan aka Donya Zenutrients who clued me in, when she told me that this hip, vintage-inspired shoe line from LA was coming to Manila. 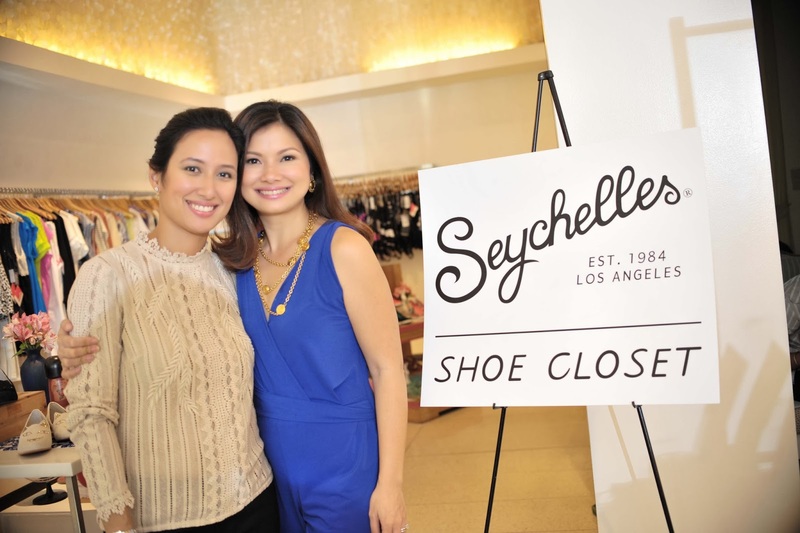 She introduced me to the ladies responsible for bringing Seychelles to Manila, Pia Miranda & Casey Marty a few months ago and it was such a thrill to get first dibs on the shoes, along with their family & friends. Casey & Pia invited us to the Seychelles pop-up at Itsie-Bitsie, and that was a lot of fun too! Casey had told me that she had been a long time fan of Seychelles, back when she was living in NYC, where walking around a lot requires comfortable, but still stylish, shoes. When she moved back to Manila, she wanted to do something else apart from her consulting job and so with the help of her friend and partner Pia, who is still based in New York, they contacted Seychelles and the rest, as they say, is history! Just look at the adorableness! I am not a colorful shoe kind of girl, but I just can't help but oooh at the prettiness of their flats, T-strap wedges, chunky funky platform heels, classic Mary Janes and ankle-strap heels. Candy Reyes-Alipio did a fantastic job with the merchandising, making it so much more fun to shop for shoes. The launch of the Seychelles pop-up was supported by Pia & Casey's friends and family, and attracted just about every girl who appreciates comfort, quality and style! 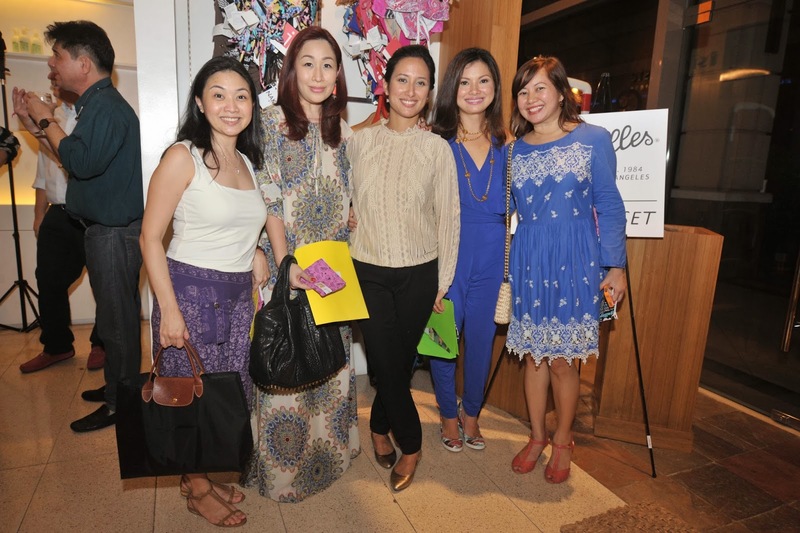 Many of us went to Itsie-Bitsie wearing the Seychelles we pre-shopped! Heehee. 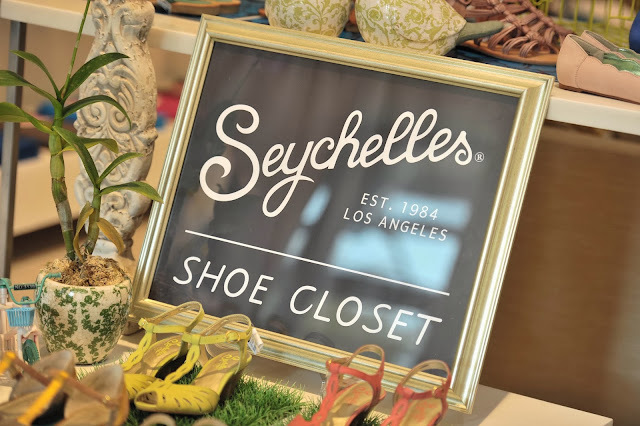 I first heard of Seychelles from my friends Rissa Chan & Cris Lagdameo who also lived in NYC, and who swear by it, and my sister Trina who has been buying her pairs from Anthropologie from years ago and I don't know what took me so long to get into it. My Sage sandals truly are so comfortable, and I wear my pair with anything and everything. Thankfully, Seychelles is here in the Philippines and whenever I need another pair, it's just a skip and a click away. For wholesale, press and retail inquiries, please contact sey@martymiranda.com or text/call +63917 814 6681. For updates, Like Seychelles Philippines on Facebook: https://www.facebook.com/SeychellesPH and follow @seychellesPH on Twitter & Instagram. Lotte Xylitol is a Halloween Treat! Parents, in this season of Halloween sweets and candies, you might want to be a hero to kids, and the parents in your neighborhood as well, by giving away Lotte Xylitol gum instead! Unlike sugary treats that can damage the teeth and gums when consumed in excess amounts, Lotte Xylitol is in fact an ideal addition to one’s dental habits. It complements other practices such as visiting the dentist regularly, brushing the teeth, flossing, and gargling with mouthwash. That's just like handing out a toothbrush for Halloween, except kids will love chewing Lotte Xylitol gum! Xylitol is a 100% natural sweetener that was first derived from birch trees in the 20th century. Initially discovered and used as a sugar substitute, this sweetener is comparable to table sugar or sucrose—but with only two-thirds the food energy and 75% of the calories. Xylitol is sweeter than sorbitol and is as sweet as sucrose, making it the ideal substitute to cavity-causing sweeteners. It is widely known that sweets are bad for the teeth. Xylitol, however, is an exception. Xylitol is predominantly used in dental health products such as dental health candy, dental health drops, and dental health gum. Your best source of Xylitol? Why, Lotte Xylitol gum of course! I have been using Phyto shampoos for two years now, since I read a feature on Laura Garcia at theglow.com. This mom with gorgeous locks shares that she uses Phyto, and her photos were enough to convince me to splurge as well. So I was super pleased to know that Phyto has a variant that is specially formulated for babies. One of the shampoos I switch around with Xavi's Mustela is PHYTO phytomiel, a gentle hypoallergenic shampoo for babies formulated with Honey wax absolute & Apricot Phytomiel. With a botanical washing base, it washes hair with ultimate gentleness, does not sting the eyes and rinses out rapidly. As if these weren't good enough, it leaves hair easier to detangle and soft to the touch. Available at Rustan's Department stores, a 100ml bottle retails for Php 695. Here's a roundup of products I've gathered since August to now, that you might want to check out at your favorite grocery or health & beauty supplies stores. Got teens? Pure & Fresh is a mild and gentle feminine wash that is clinically formulated with the right pH level. Enriched with milk proteins and chamomile extract, it is mild and suitable for teens’ skin and ideal for everyday use. Pure ‘n Fresh Feminine Wash is available in selected supermarkets, drugstores and beauty stores nationwide. Choose amongst 3 variants: Mandarin Kisses, Fabulously Fruity and Berry Twist. A 50mL bottle retails for Php39.65 and the 100mL costs P70. 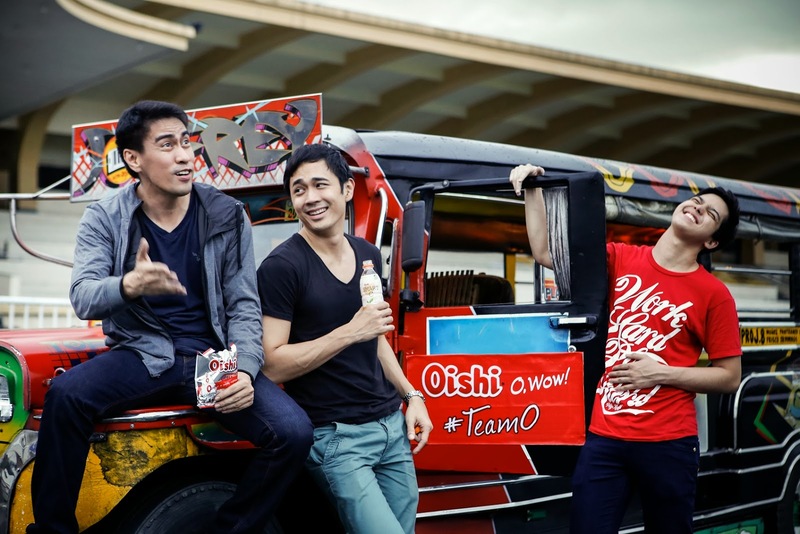 From Oishi "O, Wow!" comes Oishi Oaties Milk and Oishi Oaties Choco Chug Chocolate Milk Drink. Why Oaties? Because unlike ordinary cow's milk, both have finely ground oats mixed into the milk to make it creamier, and yummier. 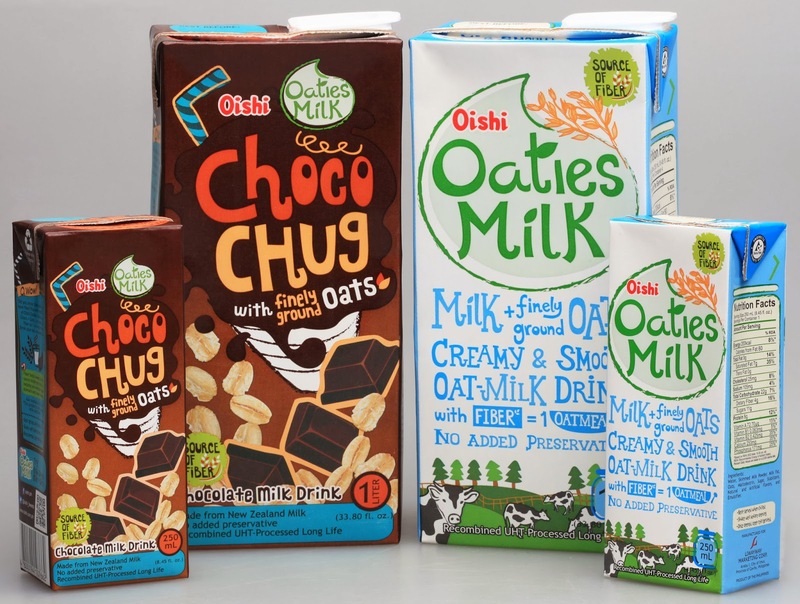 The first ready-to-drink milk of its kind in the market, each 250 ml tetra pack milk carton serving (Berry's is a giant version, heehee) contains 4 grams of fiber which is equivalant to the fiber content in a bowl of oatmeal. Now wouldn't this be such a healthy drink to pack for baon, or for long road trips? 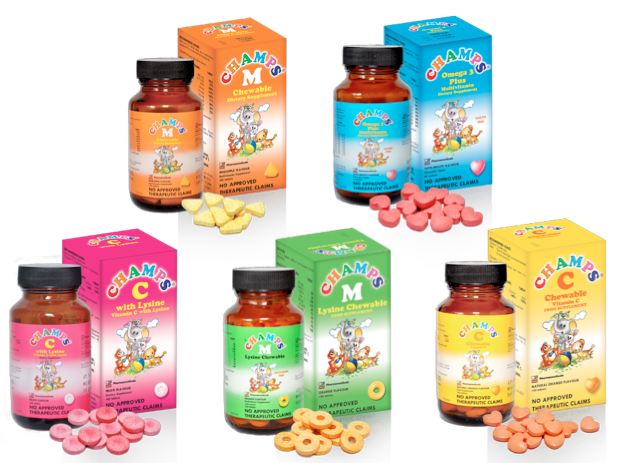 CHAMPS chewable multivitamins for kids comes in 5 variants: CHAMPS Vitamin C, CHAMPS M, CHAMPS M with lysine, CHAMPS C plus lysine, and CHAMPS OMEGA 3. The chewable tablets come in various shapes and tasty flavors making it fun to take vs. sticky, messy multivitamins that come in syrup form. CHAMPS is a product of the Chemical Company of Malaysia, the largest generic pharmaceutical company in Malaysia. Anti-stretchmark creams are coming out one after the other, that if stretchmarks could only shiver in their boots, they would be doing so now. While technically not for kids, this product is for the mom with a little kid growing in her tummy. From UNILAB comes Celeteque Maternity Anti-Stretch Mark Cream with skin firming agents such as Elastonyl and Alchemilla vulgaris extract that help protect and restore the tone and elasticity of the skin. It also has effective moisturizers such as Phyto Collage and Shea Butter to help skin become more pliant or stretchable. Just apply the product liberally using circular motions on stretch mark prone areas such as the abdomen, the arms, hips and thighs and for best results, and use it both in the morning and evening. Céleteque DermoScience products are available online at http://service.healthfirst.com.ph/celeteque/ and at Watson’s, SM Department Stores, and Robinson’s Department Store for Php 445. 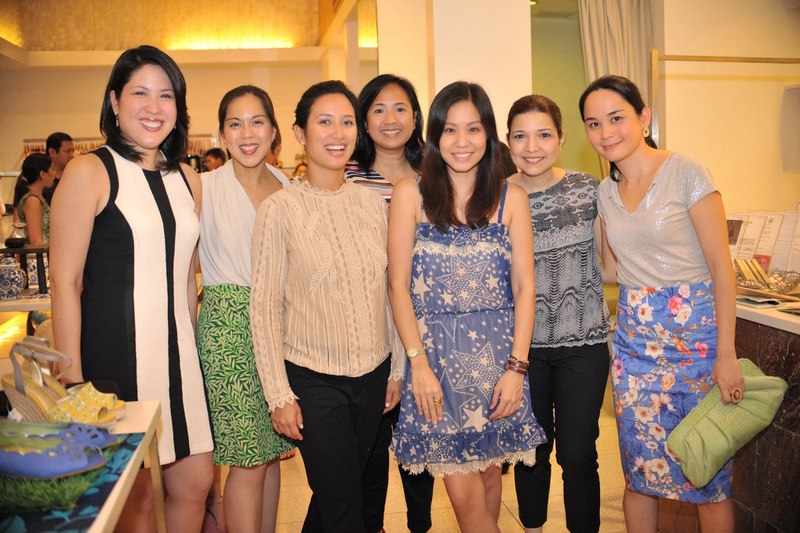 A few weeks ago, my friend Anna Meloto-Wilk of Human Nature invited the SoMoms over for brunch at Mom & Tina's Libis to share with us the relaunch and new look of Human Nature’s Natural Baby Care Line, introduce their fun new products for kids and of course, pick our brains for product development. Because moms really, are like the best resource people, I swear. They've done away with the old blue & white packaging for a look that is decidedly greener also aesthetically. The inside is of course, honest to goodness green & natural. Natural Baby Wash 99.3% Natural (P 289.75 for 500ml; P 129.75 for 200ml; P 44.75 for 50ml) is free from harmful chemicals such as SLS and SLES, and is perfectly safe to use on baby’s delicate skin. Touches of lavender, rosemary, and chamomile help calm and relax your baby from top to toe. Natural Baby Lotion 100% Natural (P 129.75 for 200ml; P 44.75 for 50ml) is perfect for nourishing and moisturizing baby’s skin, which is ten times more sensitive than ours. This 100% Natural Baby Lotion is made with a medley of sunflower oil, avocado oil and aloe vera. Completely free from harmful chemicals like silicone and parabens, it contains natural glycerin that gently seals in moisture for healthy skin that’s baby-soft and supple. Natural Baby Wonder Oil 100% Natural (P 129.75 for 100ml) Made with premium-grade sunflower oil, it’s gentle and safe to use for infant massage, a crucial step for baby’s development as it stimulates brain nerves. It also lowers the baby’s stress level for a stronger immune system. The Natural Baby Wonder Oil is ideal for infant massage, helps prevent and soothe diaper rash, helps protect against skin infections, helps heal little bumps, boo-boos and insect bites and is a gentle cleanser for the ears and belly button. Second, bath time becomes fun with these fruity shampoos and chocolate-y soap! 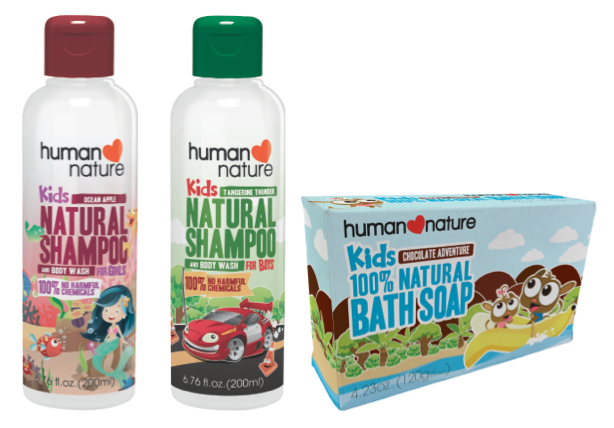 Human Nature’s Kids Natural Shampoo & Body Wash comes in Ocean Apple for Girls and Tangerine Thunder for Boys. It is 96.4% Natural and 100% free from harmful chemicals, retailing for as low as P44.75 for a 50ml bottle. Human Nature Kids Natural Kids Bath Soap is unlike any ordinary soap out there, with its yummy Chocolate scent. 100% Natural and 100% free from harmful chemicals, you also get to save yourself from bath time struggles with just P69.75. Human Nature is the Philippines’ largest brand of genuinely natural personal care, cosmetics and home care products. Operating as a social enterprise, it is driven by the core philosophies of being PRO-PHILIPPINES, PRO-POOR and PRO-ENVIRONMENT. Founded by Anna Meloto-Wilk and Camille Meloto, daughters of Gawad Kalinga founder Tony Meloto, Human Nature’s products are 100% made in the Philippines and 100% free from harmful chemicals. Get Human Nature online at www.humanheartnature.com/buy and at Rustan’s Supermarket, Shopwise, Beauty Bar, select Robinson’s Supermarkets, Landmark Department Stores and Sesou Nature Source for a select line of Human Nature products. Plush & Play is a homegrown Filipino brand that offers fun, educational and safe plush toys for infants, toddlers & children that are made from a soft & hypoallergenic fabric called Velboa. Its founder, Fabien Courteille is a twenty-four year-old French social entrepreneur, who arrived in the Philippines in 2011 to do a 3-month internship with Gawad Kalinga (GK) Enchanted Farm. His short stint at the Farm gave him the opportunity to get to know and fall in love with the Philippines and its people. After Fabien learned that majority of the toys in the Philippines came from China and that most of them contain toxic substances or parts (such as plastic) that pose health hazards to children, and seeing how women staying in the GK Enchanted Farm were skilled sewers but were not employed anywhere, he put two and two together, resulting in Plush & Play. With fruit & vegetable characters wittily named Anne Kamatis, Buko Martin and such, each character tells a story that kids will enjoy and learn from, and allows children’s imagination to roam freely. To learn more about Plush & Play, visit www.facebook.com/PlushAndPlay. Watsons, the leading health and beauty retailer that provides you with everything you need to look good and feel great, honors this year’s biggest and brightest brands in the Watsons Health Wellness Beauty (HWB) Awards. Because aside from great savings, exclusive member privileges, and freebies, Watsons wants to recommend the most effective products for your daily health and beauty needs. 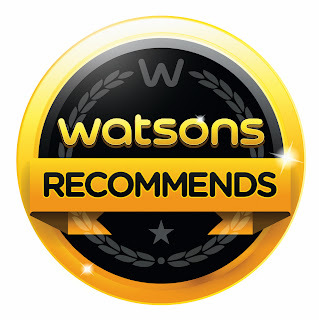 Now on its ninth year, The Watsons HWB Awards 2013 recognizes the most outstanding brands in terms of sales, promotions, customer service, and overall product excellence. Watsons holds the annual HWB Awards to help consumers choose only the best health, personal care, skincare, cosmetics, and hair care products, so they get more value for their money. Maybelline for Mascara Brand of the Year, ProActiv for Acne Care Brand of the Year, Dove Hair Care for Shampoo Brand of the Year, Kojie San for Bath Soap Brand of the Year, Colgate for Oral Whitening Brand of the Year, Ralph Lauren for Prestige Fragrance Brand of the Year, and Nivea Men for Men’s Grooming Brand of the Year. Myra E for Adult Vitamin Brand of the Year, Ceelin for Children’s Vitamin Brand of the Year, Ascof for Cough Remedy Brand of the Year, ATC Redoxfat for Slimming Brand of the Year, and Belo Glutathione for Whitening Brand of the Year. For the complete list of the winners, visit www.watsons.com or visit www.facebook.com/WatsonsPH and follow @watsonsph on Twitter. Don't let these delicate looking frames fool you. This is Titan Minimal Art - The Icon by Austrian eyewear company Silhouette, rimless, screwless and hingeless frames made out of titanium. Weighing only 1.8 grams, it is the lightest eyewear in the world, make that, the entire universe. Innovative, functional and finely handmade in Austria with exceptional craftsmanship, this year, Titan Minimal Art - The Icon was again granted the red dot award for product design, besting over 4,000 entries for 2013. A true modern classic, it was first introduced in 1999, and has become a sensation because of its revolutionary design, selling over 8 million models worldwide. It has proven so popular, it is even worn in outer space. For more than ten years now, Titan Minimal Art has been flying with NASA astronauts into outer space and accompanying them on their great space adventures. And like the girl who has everything, these frames are quite the looker too. Clean, simple and elegant, style icon Cate Blanchett approves. Strongly enough to be the face of Silhouette. Dada is in good company. He has been wearing Titan Minimal Art for a few years now actually. Let me tell you, these frames are as tough as nails. It has been grabbed from his face by the kids so many times, but it's still around, looking as good as when he first bought them years ago. True story. What began with a vision – eyewear as an accessory – in 1964, is today the world's leading brand in lightweight, quality eyewear: Silhouette. Under this brand, the lightest eyewear in the world is produced in Austria with a great love of detail, mostly by hand, in an individualized design using only the best materials and state-of-the-art technologies and exported to 100 countries across the globe. In 1999, Silhouette revolutionized the world of eyewear with Titan Minimal Art weighing just 1.8 – 2.5 grams, with no rims, hinges or screws. Silhouette eyewear has accompanied astronauts into outer space on 35 missions, has traveled around the world with the Vienna Philharmonic Orchestra, and is worn by a number of big names in entertainment, business and politics. If there is no such thing as too many sippy cups for kids, then us big ones can't get enough water and drink bottles either. Even if you have ten on rotation, don't you just want one with say, a storage compartment? 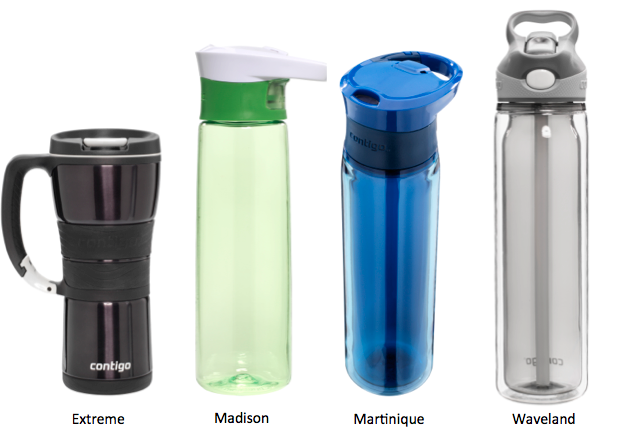 That's what Contigo is all about, a premier travel mug and water bottle brand that has found its way to our shores, after gaining popularity in the US, Europe, Middle East, South America, Australia, and Japan. 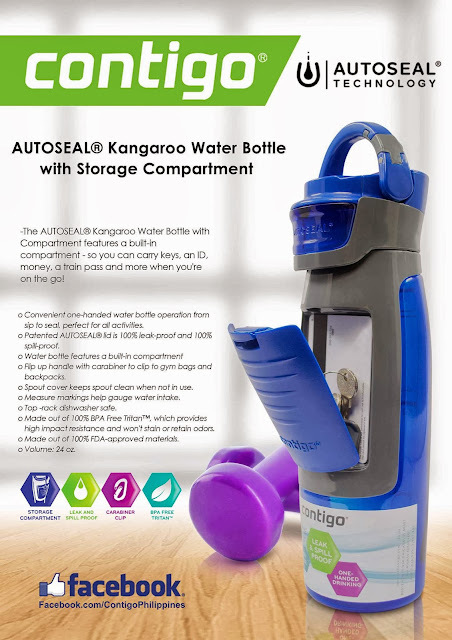 What makes Contigo different is that they offer solutions to the challenges that concern people with active lifestyles. I mean, how can you get into that state of Zen if your keys and class cards are splayed about with your water bottle and towel? Would you enjoy seeing your coffee overflowing into your car's cupholder as you navigate that speed bump? Or think about the lukewarm taste of water while biking the Nuvali bike trail. Not fun right? 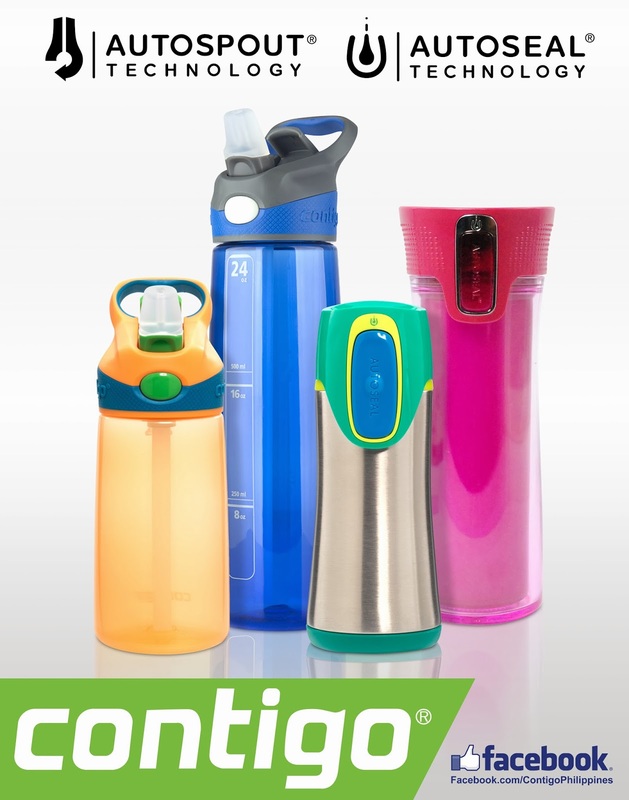 With unique bottle features like 100% leak and spill-proof caps, heat retention of up to 4 hours, and cool retention of up to 12 hours, Contigo's line of simple yet functionally innovative and environmentally friendly drinkwares will treat customers to a mess-free and refreshing beverage experience every single time. Doesn't hurt that they look great too. Nikki Ng of Contigo Philippines sent us these lovely Contigo water bottles. Love how they're sporty yet sleek, and come in these fun, jewel toned colors. 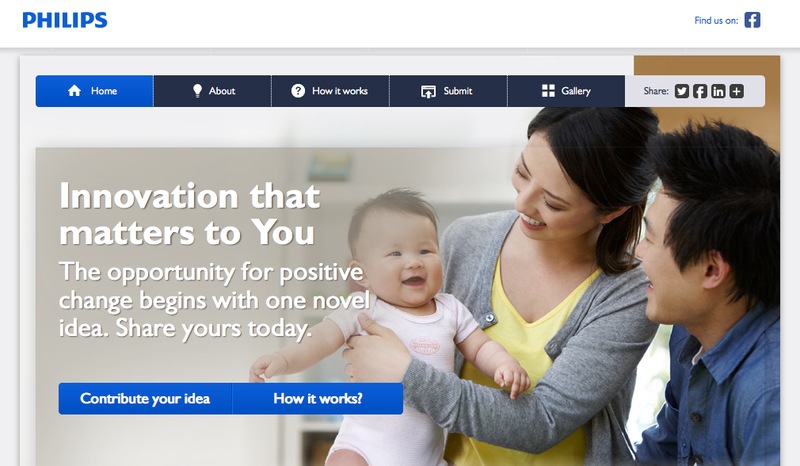 Ever since 2003, Contigo has continuously been featured in publications like Good Housekeeping, CBS News, The New York Times, and the Oprah Magazine. In 2007, BusinessWeek named Contigo’s Patented AutoSeal stainless steel mug as a Bronze IDEA recipient. 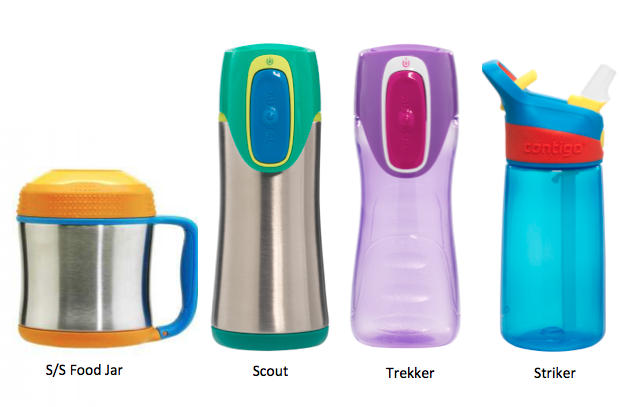 Whatever style you choose, you and the kiddos can chug on the go, with Contigo. 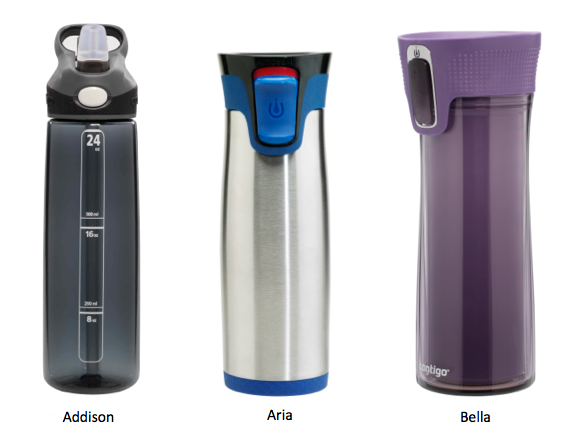 Get your Contigo at Bikram Yoga Outlets and Baby Couture stores. You may also place an order online via their Facebook Page.